Sunset in Paradise is a medium warm purple with a faint linear holo effect. Formula was perfect and applied smoothly over my regular base coat without any bald spots or patchiness. I used 2 thin coats here but one (not so) careful coat could definitely have been enough for complete coverage. 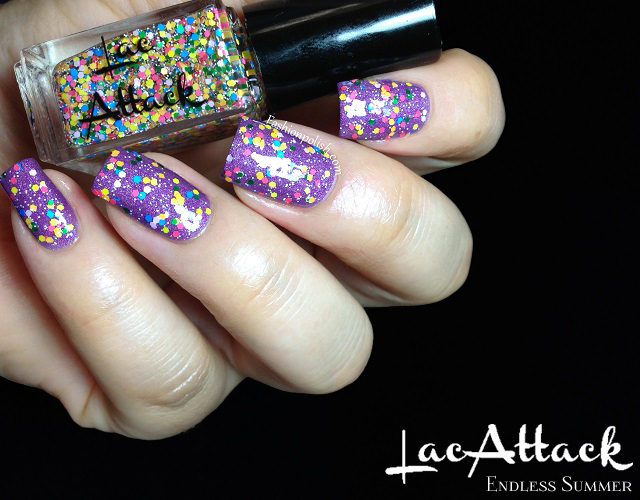 Endless Summer (over Sunset in Paradise) is a multicolor glitter bomb. There's some very small matte white hexes mixed with a whole bunch of larger matte glitters in a bright range of colors, perfect to add a very happy touch to your manicure. Glitter pay-off was really good and this is just one dabbed coat. 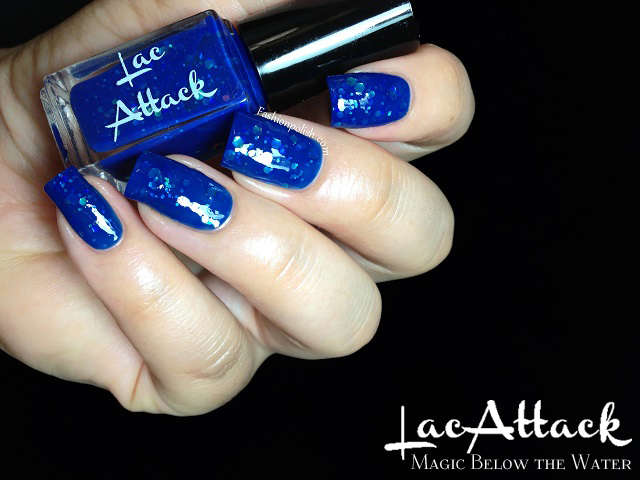 Magic below the Water is a royal blue jelly base filled with a mix of green, blue and iridescent glitters. I decided to wear this one on its own and 2 coats was all it needed for full coverage. Surfing the Sun is a coral pink base with a matching shimmer as well as a mix of various gold and purple glitters. I didn't experience any trouble with application and formula was surprising easy to work with. You're looking at 2 coats plus topcoat. Fireworks at Midnight (over Surfing the Sun) is a sheer yellow tinted glow in the dark base filled with gold, pink and blue glitters, both in bar and hex shapes. This one was on the thick side but still manageable. I swatched it both over Surfing the Sun and on its own below and used used 2 coats each time. Second picture is regular light vs black light. For a first experience with Lac Attack I must say that I'm impressed with the quality of their products. There's something for everyone in this collection but if you ask me, Sunset in Paradise, Magic below the Water and Endless Summer are my top picks! The Beach Daze collection is already available as we speak. 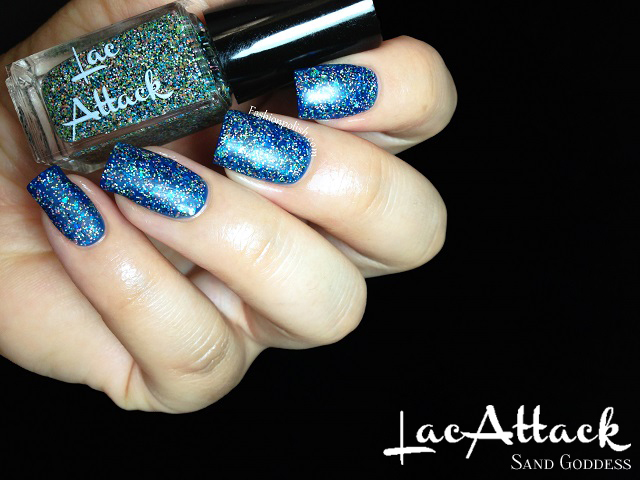 Lac Attack can be purchased from lacattack.com, Harlow & co and Beauty so Fly. What do you think about this collection? 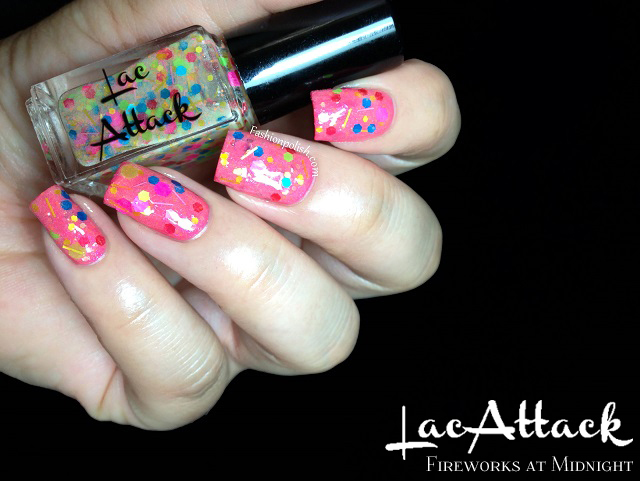 Have you tried Lac Attack before?